Over the last two years I’ve worked with a lot of students to help them change their studying trajectory. One of my superstars, Kate, came to me just before the final year of her law degree. Her grades so far were low and, because of the track her grades were on, her dream of becoming a barrister was looking unlikely. Kate felt stuck and like she had no control over her grades anymore and she was starting to believe she was just a bad student. Luckily, she decided to try again at changing her studying trajectory – and she found me! 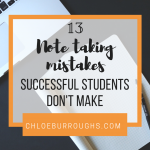 Over a few months we worked on improving her study skills, particularly around essay writing, and it worked. Her results after her second year were 53, 54, 62 and 69. 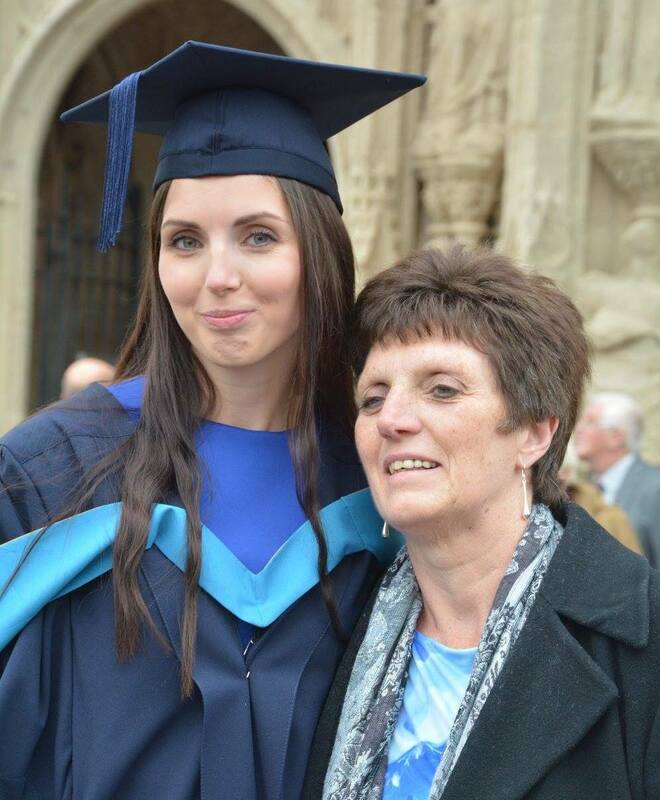 After course-correcting, her third-year results were 76, 74 and 76 – which meant she was able to graduate with a good degree and take the next step to becoming a barrister. The dream she thought was impossible was now becoming a reality – because she took control of her studying trajectory. A few years ago, I took my mum to the gym for the first time and something happened that cracked me up at the time but has actually taught me a valuable life lesson. I showed her quickly how to use the crosstrainer, then I set the resistance pretty low and asked her to have a go. She stepped up nervously, placed her hands and feet and then started to move. Almost immediately she began going really fast…and she started to panic. She shouted for me to turn the speed down – even though there’s no speed control on a crosstrainer! I ran over, helped her slow down and then helped her step off. Her legs were shaking, and she didn’t believe me when I told her that she was going faster because SHE started going faster. Therefore, to slow down she had to take control and slow herself down. Mum thought she was on a runaway crossTRAINer and didn’t realise that, at any moment, she could slow down, stop, reassess, and start again. The same happens in our studying. We believe we’re on a runaway train that we have no control over. If we get a few (or a lot of) low marks then we think it’s too late to change. We believe higher grades aren’t possible for us so we start to accept our fate rather than try and change it. At any point in your studying you can change your studying trajectory. Even if it feels like you’re too far down a path or you’re on a runaway train, you can take back control. At any time, you can stop, rest, reassess, and then start moving in the direction of the grades you DO want. If you look at your grades and wish they were higher then I want to tell you that it IS possible to change them. 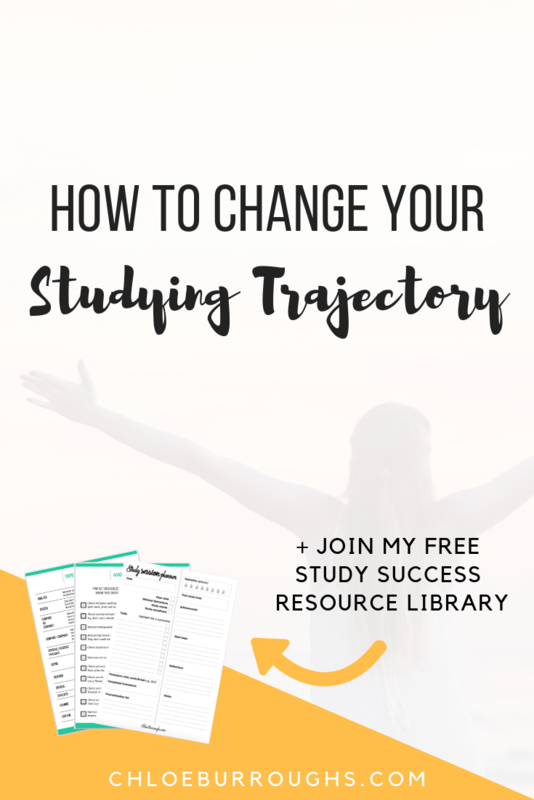 You might not believe in your abilities or you’re not sure of the steps you need to take…and that’s OK.
To help you take back control, I’ve come up with some simple steps to change your studying trajectory. If you want to change your health trajectory you might clear your kitchen cupboards of junk (yummy) food and prep some meals. To change your studying trajectory – start with a clean slate. Tidy your desk or create a motivating, clear study space if you don’t have one. File away your notes, organise your study materials and clean up your computer folders. I am world-class at burying my head in the sand when I don’t want to face something. At various times in my adult life I’ve hidden from my bank balance, my weight/fitness, my relationship…and recently my business accounts. I get it. When you’re scared of what you might find it’s easier to hide away. But you can’t change your studying trajectory if you don’t know where you are right now. 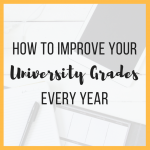 All universities and colleges will have a specific way that they calculate final grades so it’s important you go to them to find out the process. Some universities might have online calculators you can use or you may have to do the calculations yourself. One of the resources in my FREE Boost Your Grades Training is a calculator to help you work out your weighted average, which will calculate for you a weighted average based on your individual assignment/exam marks and the importance of each. A weighted average is a pretty standard method used as a first step in working out your grades. You can sign up to this training for free here. Now you’ve worked out the grades you do have, spend some time thinking about the grades you WANT to achieve. Dream big here because it really is possible to create a large increase in grades once you improve your study skills. 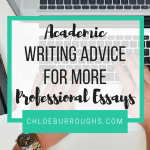 I’ve worked with students who’ve gone from achieving 40-50% in essays to 60-70% and beyond so really think about the grades you would LOVE to achieve. You can use the calculator from the above step to play around with numbers. 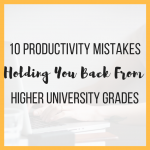 If you gave all your effort to a higher-weighted assignment and achieved a high grade there, it could pull the rest of your grades for lower-weighted assignments up. Reflection will help you work out why you’ve achieved the grades you have, what your studying strengths are, and what you can tweak to change your studying trajectory. 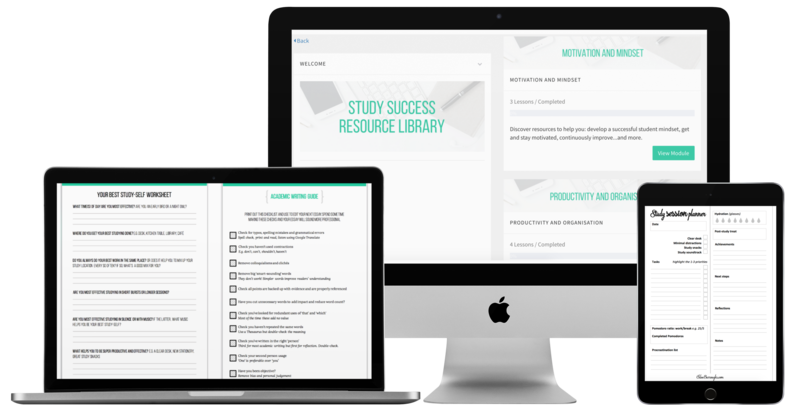 I have a printable questionnaire you can download and fill out in my FREE Study Success Resource Library. What study methods do you use and are they working for you? What successes have you had in your studying? What do you enjoy learning in your course? What study skills would you like to improve? After answering these questions, come up with at least five actions you could take to improve your studying or study skills. - Complete your priority study tasks first. - Enrol in one of my courses to upgrade your study skills faster. Studying for a degree or any higher-education qualification takes a long time so it’s natural if our motivation wanes every so often. Getting re-motivated will help you as you change your studying trajectory. Remind yourself of WHY you are studying. Think about the positive benefits studying has bought and is going to bring into your life. 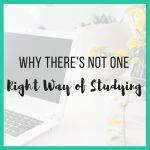 Click here to read my blog post where I outline an exercise to help you identify your two types of studying motivation. This last step is the most important. Now you’ve worked out where you want to go and some steps you can take to get there – it’s time to do the work. From your list of actions you could take to improve your study skills, choose one and implement it in you very next study session to start seeing results. 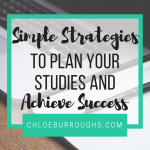 Don't forget to sign up to my FREE resource library to help you uplevel your study skills and change your studying trajectory.